I love the cold! I know so many people do not, but I love it. I love putting on my sweaters and a jacket. I love my scarfs. I love a roaring fire. Love seeing the breath come out of my mouth. I love even one flake of snow. I love icicles. I love the feeling of warmth filling an ice cold room. I love getting in my bed and pulling my down sleeping bag over me. My father-in-law is fighting cancer. We have been in and out of the hospital with him over the last three weeks. He was able to return to his assisted living center with additional daily help. On Tuesday we went to see him and were amused at the fountain out front. It was still going and still freezing. It was beautiful. I walked around it trying to get a picture, but it does not do it justice. It was way colder than the picture implies. It was a huge block of ice. The wind was whipping past it and going right through me. The fountains had spilled over the edges and the apron around the fountain was like an ice skating rink. As I walked around trying to get the picture I wanted I walked like a tightrope artist trying not to fall. I made it. In the middle of my father-in-laws battle have been some bright spots. His new caregiver is a joy, competent doctors and innovative treatments have been a wonder, the small niceties and encouragements have been a lift to our spirits. Christmas in the hospital was not what we expected, Jesus still came, gifts were given, family was together. There were lots of smiles and some laughter. In the middle of challenging circumstances there still can be beauty. 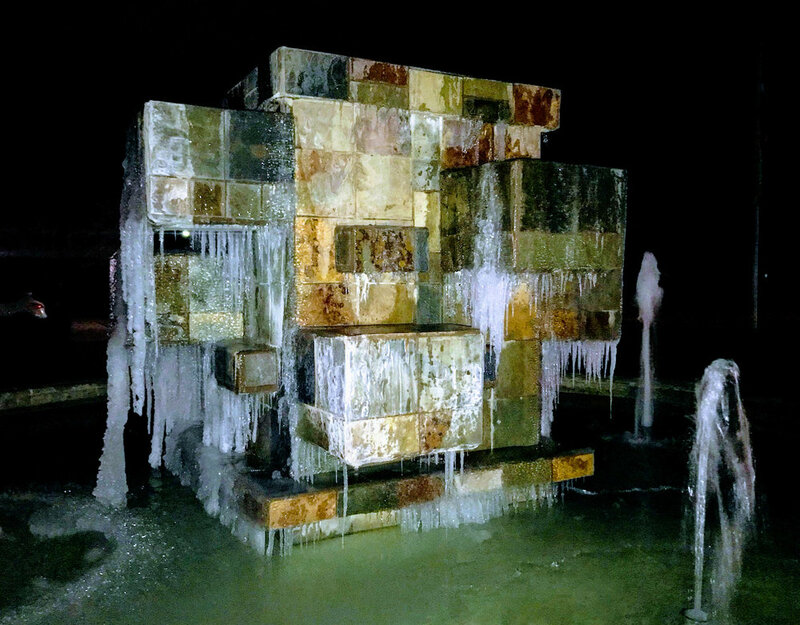 On the edge of the fountain was an icicle. When I was a kid, we used to grab them and play like they were swords (I lived in Colorado and New York). I didn't pick it up, but I made me want to be a kid again. As I walked away, the fountain had really lifted my spirits. Beauty in trouble, I belive in it.